Graham Clark and Dave Shumka, from Stop Podcasting Yourself, will be joining us for MaxFunCon 2011! If you don't listen to their delightful and hilarious podcast already, know that you should. Here's a great episode featuring comedian Paul F. Tompkins that illustrates why Graham, Dave, and Dave's dog Grandpa are awesome. Be sure to visit www.maxfuncon.com to find out everything there is to know about MaxFunCon 2011, and subscribe to the MaxFunCon Podcast. If you were waiting to buy your MaxFunCon ticket, you've waited too long... tickets are sold out! We do, however, expect to release a few tickets over the next few months, once we have our full lineup booked. Last year, we even released one or two just a week or so before the event. If you snoozed and are concerned you may have losed, get yourself on the wait list. Email waitlist@maximumfun.org and we'll let you know if any spaces open up before June 10. Please be sure to include your name, phone number, and whether you wish to purchase a single ticket or a ticket for a couple sharing a bed. MaxFunCon Registration is Now Open! Registration for MaxFunCon is now open. Join us June 10th-12th, 2011 in Lake Arrowhead for the time of your life! Registration is $790 per person (plus a small processing fee) and includes everything you will need for the weekend - lodging, food, drink, classes and shows. We even offer a $100 discount for couples sharing a room. For a limited time, you can also pay via an installment plan - four monthly payments of $197.50. For the first time this year, all registrants will receive a special gift package (pictured above) upon registration. 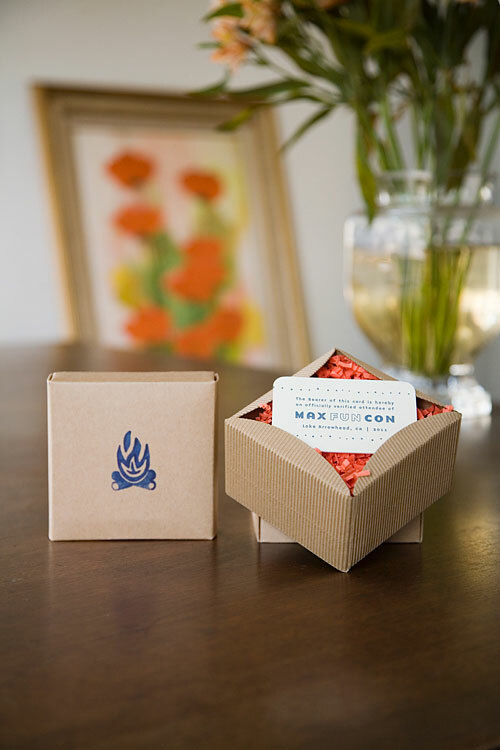 MaxFunCon is a wonderful holiday gift for someone close to you - or for yourself. Registration for MaxFunCon is extremely limited - only 150 guests will experience this special weekend - so register now or risk being left out of the fun.